Learning how cool down an overheated dog can save your pet's life. Once you have diagnosed signs and symptoms of a overheating dog, you should take steps to attempt to cool them down immediately. If you are out playing or walking in the sun and you begin to notice excessive panting or other signs of overheating, immediately move your dog somewhere cooler, and if you can, take their temperature. If you are out and about then move them into the shade, into a car or building with air conditioning, if you are near home, move them into the house with air conditioning, or at the very least, a fan. If their temperature is 104ºF or lower, stay in the cool area and offer small drinks of cool water until intense panting subsides. If their temperature is higher, proceed to step 3. If your pet is still conscious, offer them water in smaller amounts. Try not to let them drink a lot of water at once, as this can lead to vomiting and increase dehydration. Coconut water is also good to re-hydrate pets, as it has tons of electrolytes but is more natural and safe than other drinks with electrolytes, such as Gatoraide. Keep a close eye on them, and once your pet seems more comfortable, call your vet. If your pet cannot stand on their own, or if they become unresponsive, check for breathing and a heartbeat, and if you can, get someone else to call the vet for an emergency appointment as you proceed to step 3, below. Since using very cold or ice water can be too much of a shock to an overheating pet, and cooling too quickly can trigger other life-threatening conditions, it is imperative to slowly use any available source of cool water to wet your dog. 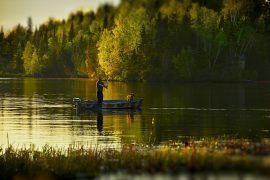 The ocean, lake or river is great if you are near a body of water. Many public spaces have water parks that could be used, or at the very least, a bottle of water you are carrying with you. If at home you could use a child’s size pool or the bathtub. If you have something to submerge the dog in, slowly introduce them to the water, starting with their feet and working upward, as dogs cool from the bottom up. If you do not have a tub or body of water, and only option is to pour water on the dog, begin with the head and legs, and pads of the feet. 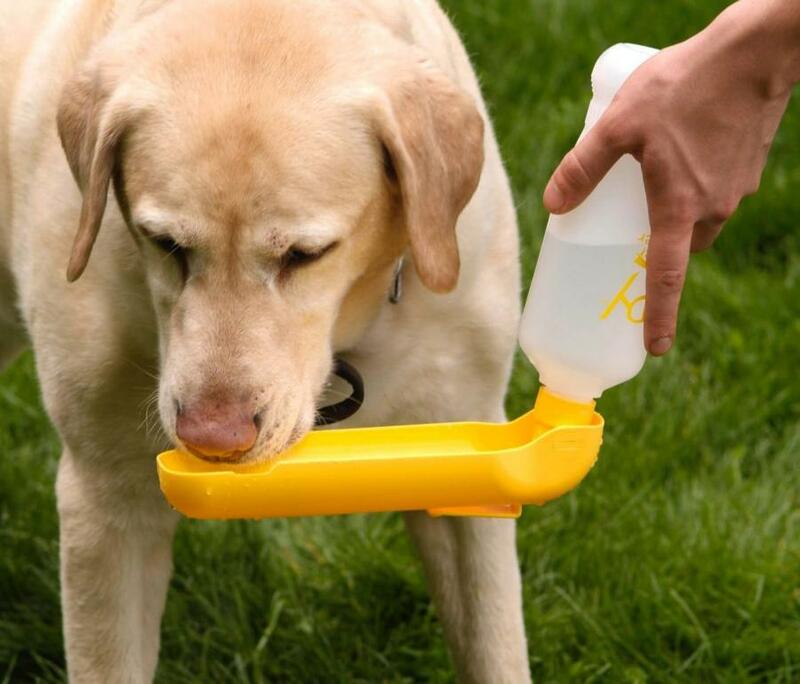 Once the whole dog is damp, keep a continuous stream of cool water flowing over them, using a shower head, hose, watering can, bottle, etc. Using cool wet towels on the paws, abdomen, head, and neck is good too. You can carefully cool the tongue as well, but if your pet is unconscious and they cannot swallow on their own, be careful not to let any water into the throat, as they may accidentally breathe it in. 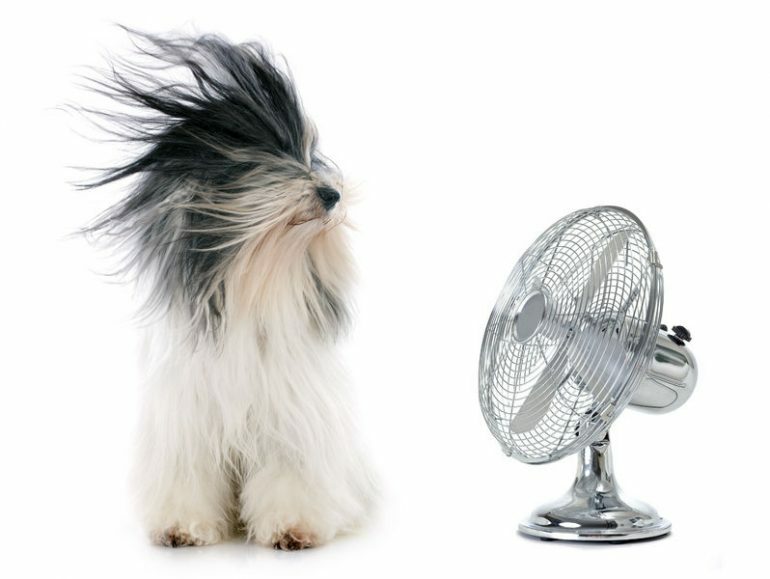 While you are cooling your pet with water, having a fan blowing on them can help speed up the cooling process. Keep taking your pet’s temperature periodically and if it is around or under 104ºF, you may stop the cooling process. Continuing to cool them down can lead to blood clots or take their body temperature too low. 5. Get thee to a veterinary clinic! 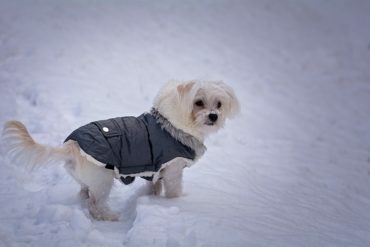 It can be vital to at least attempt to cool the dog down with the steps above, until they reach a stable temperature before putting them in the car to go to the vet, in order to prevent their condition from worsening as you travel. As mentioned in step 2, you should have already called the vet to let them know you need an emergency appointment. If your vet cannot accommodate this, or if it is outside normal operating hours, most cities have 24 hour emergency vet clinics you can call. 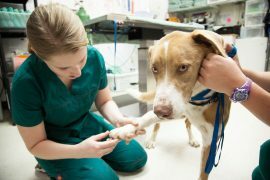 It is important to get the dog to a veterinary clinic right away, even if they appear to be recovering. 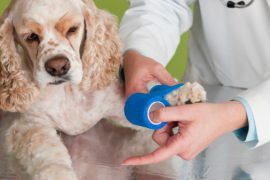 Once at the vet, they can run tests to ensure that no lasting damage to any of the internal organs or brain has occurred, and if it has, treat it and advise you on how to proceed. Once a dog has experienced heat stroke or worse, it is more susceptible to happening again in the future, so be extra mindful of your pet’s sensitivity to heat in the future!